*Bluetooth* *Sunroof/Moonroof* This 2018 Mitsubishi Outlander PHEV GT is Ruby Black Pearl with a Dark Brown interior. 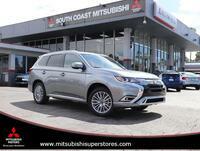 This Mitsubishi Outlander PHEV GT comes with great features including: Bluetooth, Leather Seats, Sunroof / Moonroof, Satellite Radio, 4-Wheel Drive, Rain Sensing Wipers, Keyless Entry, Tire Pressure Monitors, Leather Steering Wheel, and Cruise Control . Buy with confidence knowing South Coast Mitsubishi has been exceeding customer expectations for many years and will always provide customers with a great value!